Ed Royce helped free nearly 68,000 prisoners from a Nazi concentration camp. 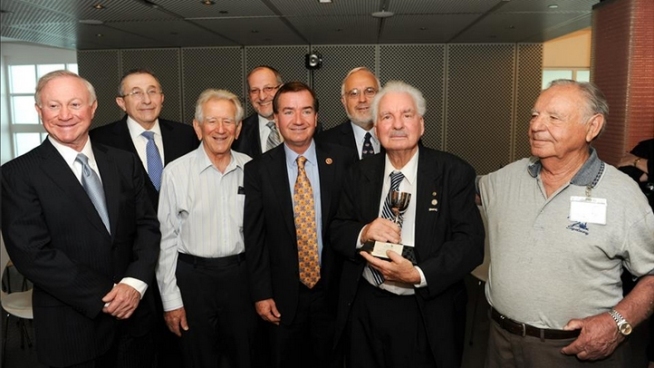 Ed Royce Sr. (holding award) was honored Monday, July 1, 2013, for helping liberate prisoners from a Nazi concentration camp in 1945. An American soldier who fought in WWII and some of the prisoners he helped liberate from a Nazi concentration camp were reunited Monday when the veteran was honored for his service. Ed Royce Sr., 91, was 20 when his Army unit freed nearly 68,000 prisoners from Germany’s Dachau concentration camp in April 1945. On Monday, Royce received the Distinguished Service Award from the Simon Wiesenthal Center at the Museum of Tolerance for his part in that defining moment. “I remember it like it was yesterday,” Royce said. So do Morris Price and Albert Rosa, who were both imprisoned, malnourished, tortured and marked at when the first Americans walked through the gates of the notorious concentration camp. “I used to pick up the people from the gas chamber and take them to the crematorium,” Rosa said. The brutality of what he was forced to do is fixed in his mind. Rosa is the sole survivor of his Greek family of 70. “I saw (my) sister beat to death because I was talking to her behind the fence, and I saw my brother hanged,” Rosa said. Royce’s son, the California congressman of the same name, values the meaning of that event six decades ago. “It’s also a reminder, as my father says, that when someone is talking about exterminating a race, when someone is trying to incite people in order to exterminate a race of people, there's a very clear precedent,” he said. When asked what the meaning of freedom is, the older Royce and the men he liberated said it was about educating younger generations and continuing to fight hatred. “It also means you have to be responsible and know what's going on and draw the right conclusions,” Royce Sr. added.